For those who love the thrill of cruising the open water, exposed to the elements but don’t have the time and money required for yacht cruising, daysailing provides a sterling alternative. Daysailing offers fantastic diversity, with activities to suit everyone – whether it’s the adrenalin rush of speeding across the water's surface or the tranquil pleasures of a lazy afternoon gliding across a sun-kissed lake – and with concerns about global warming rising, it also provides an eco-friendly activity to keep consciences clear. Unlike yacht cruising, where the craft has accommodation for long voyages, daysailing is so named because it is a daytime activity without overnight amenities. Daysailing is a broad term encompassing most small sailing vessels, the most common of which are dinghies, small keelboats and multihulls. A dinghy is an open single-mast boat, no longer than 20 feet, the direction and speed of which is controlled by the use of sails and underwater foils. They come in a variety of sizes and types suitable for lone sailors to families and from aerodynamic speed craft to safe and comfortable craft that are easy to handle in all weathers. Sailing keelboats differ in that they are generally larger and have a weighted keel for greater stability and safety. Multihulls are performance dinghies with either two or three hulls, known as catamarans and trimarans respectively. This design feature means an increase in speed but a reduction in manoeuvrability making multihulls ideal for those who love high-octane thrills and getting wet. Your requirements will likely alter as your skills and aims develop but it is advisable to begin with a simple one person craft such as the Laser, the most widely owned small dinghy in the world. For a slightly larger crew the Wayfarer is also a popular all-rounder. If you are uncertain about the boat you want then it is common for manufacturers to offer test sails. 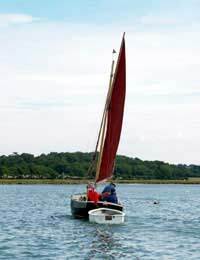 Daysailing can be practised on inland lakes, in coastal waters or even on holiday. Sailing on inland waterways is ideal for beginners because these areas are usually calm and free from large traffic and often supervised by clubs with rescue craft. Sailing on holiday, in the sunshine of the Mediterranean or the Caribbean for example, is also a safe and easy way to learn, with the added bonus of warm water and reliable weather. The downside is that this is the most expensive option but if you were planning your summer holidays in the sun then why not combine the two. Coastal sailing is more suited those sailors who are familiar with the basics and want to test their new skills against the unpredictable weather, tides and surf of the sea. This is a more challenging but ultimately more rewarding and skillful discipline. Daysailing is not only one of the cheapest routes into sailing it is also one of the quickest. With professional instruction it is relatively easy to pick up the basic sailing skills in a few hours and be cruising across the water within a week. Many activity centres offer group taster courses for those who want to find out whether the world of dinghy sailing is for them before committing to a full-time course. These taster days usually cost from £10 to £40 and give beginners instruction and demonstration in a dinghy with a qualified instructor. Level 1, 2 and advanced RYA courses are available for those confident daysailing is for them. The courses cover basics from boat handling and theory to navigation and seamanship and range in price from £100 to £300. Daysailing is a fantastic recreation that suits all sailors whatever age, shape or size. With professional instruction novices will be sailing independently within in week, but as it is difficult to master it will offer a lifetime of challenges and rewards.